Your letters, stories, pictures, memories and thanks. Meet Blessing, the Charmed Tiny Kitten, & our featured adoption happy tail! "On April 25th I went to work at Countryside Pet Clinic in Greenville like any other Tuesday. [That soon changed.] We received a phone call from Bond County Humane Society about a [sick] momma cat who had delivered one baby on her own but may still have more. Sure enough, X-rays showed more. Dr. Brittni Davis and I prepped for an emergency c-section to try to save momma Sweetie and her three babies. Together we got them out, and I put a baby inside my shirt on each side and kept the other one in my hands to keep warm. After a good 30 minutes all three kittens were moving and crying and ready to be with mom. So weeks went by and my husband and I had a cat that passed away from kidney disease on May 27th. My husband kept pestering me about getting another cat and I kept putting him off, not thinking I was ready. Then I showed up to work and spoke to KayAnna from BCHS; she told me she had a little guy named Blessing there for neuter surgery and who he was. Once I saw him again I knew I wasn't going to leave him. We have a special connection and I might have saved his life; I just couldn't pass the opportunity to make him mine. He has definitely filled a hole we needed filled. He is a handful, entertaining, and always purring. His name is now Pablo. Thank you for giving me this sweet blessing,"
Ms. Moo was seven years old when she was surrendered to BCHS. Her owner had passed away and a neighbor brought her to BCHS. A family in Edwardsville adopted Ms. Moo in February 2008. Red is an American Staffordshire Terrier that was rescued by an animal lover and surrendered to BCHS. Red was fostered by the family that found him until the time he was placed in his forever home. He was adopted to a young man that was seeking companionship. Red now has a big yard to run in and a caring family. Mittens came to BCHS in May of 2007 as a kitten with digestive problems. 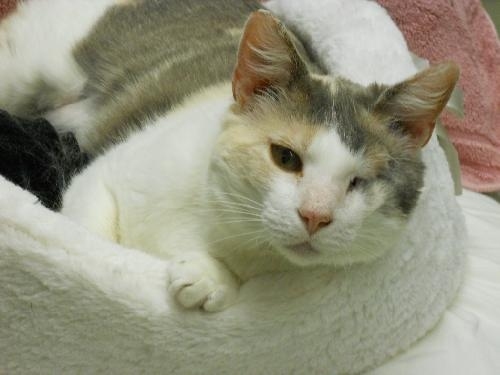 Mittens was finally adopted in April 2008 after her digestive problems had been resolved. Mittens was adopted in April to a family with a dog and a six-year-old boy.